Your #1 Xtreme Cycle & Trailer Stop In Texas! If you haven’t been by Ruhnke’s Xtreme Cycles and Xtreme Trailers in Odessa lately, then it’s time to check out what you’ve been missing! They have the best prices in the Permian Basin and they’re happy to service any make or model that you may have. Ruhnke’s Xtreme Trailers now has off-road trailers and 7′ x 12′ custom wheels for $4,500. 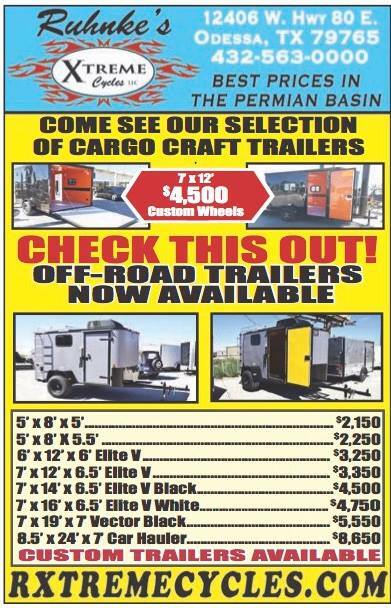 They have all the sizes you could need and custom trailers too! If you have an old bike that needs servicing just call 432-563-0000 and get a fair quote for the work you need done. Xtreme Cycles has the best bikes in town like this 2015 Rides & Rods Custom Softail Bobber for just $19,999 + TT&L! You can even get a 10% discount when you mention the ad pictured above, so no excuses, it’s time to get your next amazing bike! Stop by 12406 W. Highway 80 E. and see them or shop online at www.rxtremecycles.com.